Tune up your engines for hours of high-speed fun and adventure when the new Ferrari Land theme park roars into action. (TRAVPR.COM) UK - March 9th, 2017 - This brand-new sports car attraction inside the PortAventura theme park opens its doors to the public for the first time on April 7, 2017. The opening will mean that PortAventura World becomes the largest concentration of theme parks within one resort in Europe and increases the attraction of the Costa Dorada to both holidaymakers and day trippers alike. It covers an area of 70,000 square metres and is inspired by and dedicated to the iconic motoring company. But, the spectacular destination isn't just for petrol heads who love to burn rubber, it's for all members of the family who revel in the thrills, spills and adrenalin-pumping fun of theme parks. The newest addition to the PortAventura World theme park complex is just a 50-minute drive from the highly popular resort town of Sitges and this will increase the attraction of family holidays in and around the town according to Alison Scriven, Director of Sitges Hills Villas, the leading holiday villa operator in the Sitges area. Ferrari's cars are known for their formidable speeds, a fact that hasn't escaped the notice of the designers of Ferrari Land's rides. The Vertical Accelerator, which lays claim to being the tallest and fastest vertical accelerator in Europe, propelles riders to a height of 112 metres in just five seconds reaching speeds of 180 km/h. That’s equivalent to 1.35 G. The accelerator route extends to 880 metres, the equivalent of seven football pitches. One of the park’s biggest highlights is how it uses technology to bring visitors close to the trackside action. The Virtual F1 Experience located within the Ferrari Experience Building lets you experience the adrenalin rush of being a driver racing round a circuit at top speed. Meanwhile, the Virtual GT Experience lets you feel what it’s like to be inside a Ferrari GT. Another way to feel something of what it is like to be a Formula 1 driver is to get behind the wheel of one of the 8 driving simulators. Start Your Engines and Go, Go, Go! 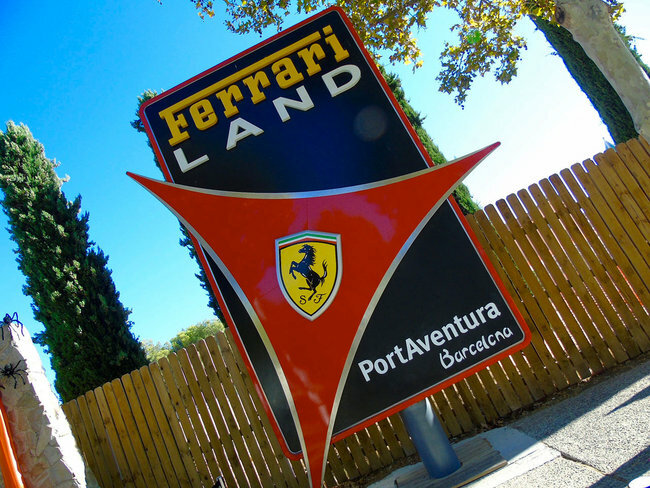 Located on the Costa Dorada between Tarragon and Salou, the PortAventurs World theme park complex is within a 1 hour drive of both Barcelona and Sitges. For details of opening times and tickets, which includes options for combined visits to PortAventura, go to Ferrari Land's official website. Sitges Hills Villas is one of the largest specialists in holiday villa rentals in and around the popular resort of Sitges in Spain. Their portfolio includes over 70 high quality properties ranging from chic town centre apartments to luxury country properties sleeping up to 46 guests. Each of the properties featured in their portfolio has been handpicked for its high quality, unique character and idyllic setting, and most have their own private swimming pool exclusively for guest use. Sitges Hills Villas offer a range of additional services to their guests to make their holidays that little bit more special. Services include gourmet food delivery, wine and cava tours in the local Penedes region, personal chef, babysitters, transport, bicycle hire, event tickets and much more. Sitges Hills Villas employs a locally based management team to ensure that the guest’s holiday in the Sitges area runs as smoothly and enjoyably as possible.